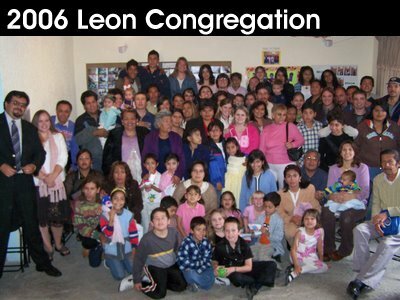 Leon, Mexico has dropped down in temperature to the low 60’s, which reminds us that somewhere in the world there are brothers and sisters celebrating the Holiday season. I hope you have had a white Christmas season with lots of gifts and joy. Jessica and I have been very b lessed this year with the birth of a baby niece and the support of our partners such as you. All in all, life has been good and we look forward to another prosperous year in Mexico. These last 30 plus days have been pretty crazy for us here in Leon. Although we anticipated a slowdown in the work for December, we ended the year with some unexpected events, and a few expected ones as well. 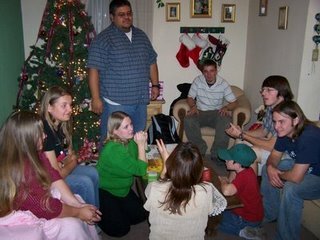 These events included our annual donation of food to the poor, a Christmas carol night, various Christmas parties to wrap up 2006, and our yearly ladies’ day. It is exciting as we look back over the last year and see how successful church growth has been in 2006. This time last year we were frustrated during the holidays to watch our numbers dwindle from 40 to 20. Although the holidays do mean less people in Leon every year, this time around we have seen our numbers drop to 60 people, a constant reminder of how blessed we have been this last year. Likewise, our events, small groups, and get-togethers have all shown both numerical and spiritual signs of growth this season, making 2006 successful in many ways. The second annual Leon Ladies’ Day seemed to be very positive again this December. 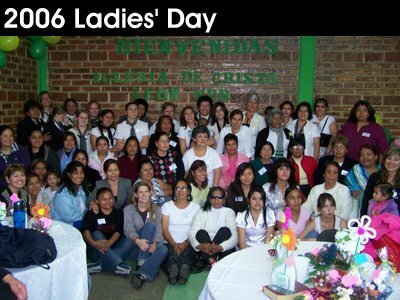 As you may recall, last year’s reunion was held in our church building and brought in Christian women from several Mexican cities who spent the day learning from God’s word with us. This year we rented a large facility, used our building to house the kids, and were blessed to see over double the amount of women that we did last year. Jessica, along with her teammates here, spoke about spiritual disciplines, while I kept the kids under wraps with games and activities. In the end, I believe the work was blessed by hosting the event and helped to further influence the country of Mexico for the cause of Christ. Our large benevolence projects each year include a clothing drive in the fall, and food donations to the poor at Christmas. As always, Jessica headed up the drive and helped contribute to the seven boxes of food that were given to various families within the city. Although we use the event to help the poor of Mexico, we were blessed this year to see evangelistic fruit come out of the contributions. Like last year, following the giving of the boxes, we saw visitors in attendance that had received the donations. It seems that based on the success of our food boxes, they will be a permanent service that our congregation will offer each year. Christmas time is as big of an event here in Mexico as it is in the States. This year we celebrated several Christmas parties (both among our workers and with members of the congregation). These eve nts are always enjoyable and bless us with good memories and stories from Mexico. Likewise, we did enjoy a night of Christmas carols as a group from Mexico City came up to Leon to sing for a few hours one Saturday night. Although it doesn’t snow much in central Mexico, the holiday season is still alive and well here in Leon. Finally, Jessica and I would like to pass into 2007 and out of 2006 by sharing with you our thoughts and prayers concerning the past and the future. Last year was so blessed for us and really helped to mold us into better people. It was a hard year with frustrations and trials, but a fun year too with successes and many adventures. We grew as a family in ministry and love for one another, while we saw our Spanish and relationships begin to blossom here in Leon. We saw the arrival of new workers, we were blessed with new partners, and we saw new Christians come to Christ. In the end, 2006 was a real blessing to us. As for 2007, Jessica and I have some neat dreams and desires that we hope and pray to see come true. God has placed in our hearts the desire to adopt a child here and we look to begin that process this year. Likewise, we hope to begin furthering our ministries this year with more studies, more evangelism, and having a stronger more streamlined work. We anticipate the arrival of new AIM students this May, as well as future interns and workers. The future looks bright, and we pray that it will be a time of peace and joy for us. Our desire for you is that 2007 will be a peaceful and joyous year as well. We thank God for your partnership and we ask that you will always remember us in your prayers. We really do need your prayers and find ourselves at peace simply when we are told that you remember us before God. Again, thank you for your part in this work and know that we bring you before God in our prayers as well.